Students who attended Chadron Prep thought they “had it made,” those participating in panel discussions on Oct. 22 said during a program that was a part of Chadron State College’s homecoming celebration. Nearly a dozen people who had attended what officially was the Campus Laboratory School, but was commonly referred to as Chadron Prep told of their experiences at the school. The lab school operated for more than 50 years. It accepted students in 1911, the same year as Chadron State opened, and was closed in the early 1960s after the college’s administration and board decided the funding could be better used to increase faculty salaries and strengthen the accreditation status. These individuals were the panelists who told of their experiences at Chadron Prep last week as part of the Chadron State College homecoming program. In front, from left, are Jan Adams, Jean Henkens, Doris Harrington, Jerry Berry, Marilyn Hills and Gary Bieganski. In the back are Lois Putnam, Jeanelle Grant, JoAnn Schaeffer, Jim Butler, Don Kay and Goldie Dawkins Mitchell. Another panelist was Don Housh. NOTE: Click on the photo to see an enlarged version. Laboratory schools were founded so college students who were studying to become teachers could practice teach in elementary and high school classrooms before graduating. The lab schools closed on many other college campuses about the same time. The college students then did their practice teaching in public and private schools. Other members of the two panels agreed with Putnam. They noted that when they were high school students, college professors often were their primary teachers. Several said playing in the school orchestra that was directed by Roy Peterson, who also directed the college’s orchestra, was a special treat. Taking Spanish under Emma Steckelberg also was a bonus, others noted. Some parents insisted that their children attend the Campus Laboratory School. Putnam said she lived just two blocks from the West Ward Elementary School in Chadron, but her mother enrolled her in Susan Frazier’s kindergarten class at the Lab School. That meant she had to walk a mile and a quarter to school instead of two blocks. Putnam said years later as a college student she did her student teaching in the same room in Hildreth Hall where she had attended the first grade. JoAnn Schaeffer had a similar experience. She attended the Lab School from kindergarten until she graduated from high school, then returned to Chadron State to earn a bachelor’s degree after raising five kids. Jim Butler, Don Housh and Jeanelle Grant had attended rural schools before enrolling at Prep. Butler said he was “scared to death” when he stepped on the college campus as a high school freshman, but got along fine. Goldie Dawkins Mitchell recalled that a few hours after she was born in January 1920, two teachers from the college stopped at her parents’ apartment and saw her. Six years later when she was ready to begin school, Mitchell said one of the teachers contacted her parents and said she should enroll at the Campus Laboratory School. She did, and remained in the Prep system until graduating from high school in 1937. Mitchell said Hildreth Hall was still under construction when she began school and her first classes were in the Administration Building. When the new building was completed in 1926, she and her classmates helped carry the supplies across the street. A couple of the participants said there was criticism of the Laboratory School by some educators not connected with the college because much of the instruction was done by the student teachers. However, the panelists said that was often advantageous because the student teachers were competitive and liked to outdo each other when it was their turn to teach. It is impossible to talk about Chadron Prep without mentioning the three Class C state championships that the basketball teams won in the 1950s. Jan Adams described the coach, Archie Conn, as a great person who stressed respect, developing friendships and being kind and understanding to one another. Another milestone for Prep occurred in 1961, the year the high school portion closed. Just a few weeks after the announcement was made, Prep won the championship at the first CSC Scholastic Contest. 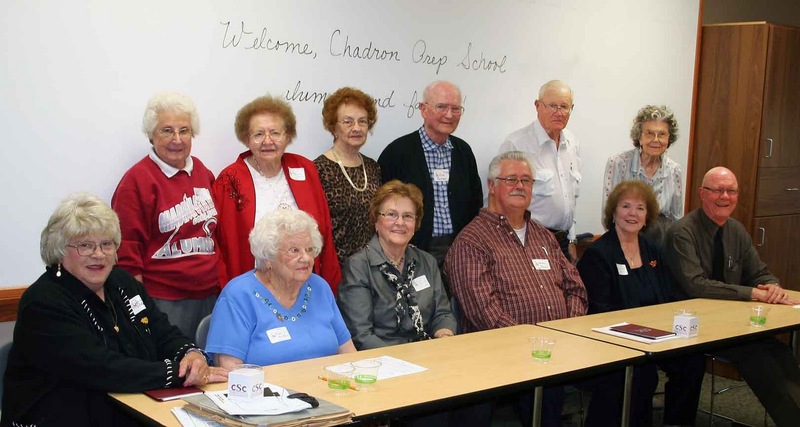 Long-time Chadron resident Jean Henkens said her experience at Prep was different than most. She grew up in Martin, S.D., but came to Chadron the summer between her junior and senior years in high school to take science courses that were taught by college faculty members Charles Philpott, Lyle Andrews and Minnie Lichty. Another of the panel members was Doris Harrington, who taught second grade from 1960 until 1964 when the elementary portion of the school was closed. She said she has fond memories of that experience and enjoyed supervising student teachers. The discussion was arranged by members of the CSC Education Department. Our deep thanks to good friend Con Marshall of Chadron for sharing this great story and photograph with Dawes County Journal!